The bronze casting process never ceases to excite me! The transformation of my wax or clay sculpture into a beautiful bronze is a fiery miracle. In this part of my website I would like to share with you this amazing process. Bronze casting was first used some 5000 years ago, and it has essentially not altered since then – although we now have more refined materials on hand like silicon rubber for detail-catching moulds. I myself do not cast my sculptures but send my wax or plasticene artwork to the foundry. The process, as you will see, is complex and requires skills with many different materials. I make the originals, and then finish the work on each cast sculpture with the patination (colour, using chemicals) and polish. 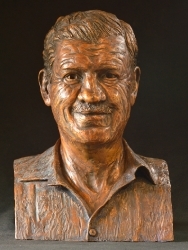 In addition, I hope to bring you, the buyer/viewer, closer to an understanding of the true value of a bronze, not only because the artist’s skills required must be studied, accumulated and practised, but because of the length and complexity of the bronze casting process itself and the skills required for this. It is essential that I find appropriate and good reference for any new sculpture I undertake to do. This is often a combination of photographing, viewing from life, drawing and watching videos of the chosen subject. This is so I can essentially "feel" my way into what I choose to sculpt before starting. Good quality photographs are essential for me to see details of the subject I am creating. A maquette is essentially a small study for a larger sculpture. When I have an opportunity to create a large sculpture I will create a maquette to learn more about my subject and the pose or structure that the final work will take. This is then shown to the client who has commissioned this large work so they may get a good idea of what the final work will look like. At this stage changes are easy to make as the armature (skeletal structure) from such a small sculpture (up to 50cm height) is flexible and therefore easily moved about. From this study I will 'scale-up' for the larger work, making the creation of the armature easier with something accurate to measure from. I usually work with a wax (microcrystalline wax, paraffin wax, dye) or plasticene (fine clay powder (ball clay), mixed into melted microcrystalline wax and some petroleum jelly), made myself. This is put onto a simple wire armature, and built up and modelled until I am happy and ready to send it to the foundry or work from when scaling up for a larger work. I may cast the maquette into bronze, to be sold as a limited edition. 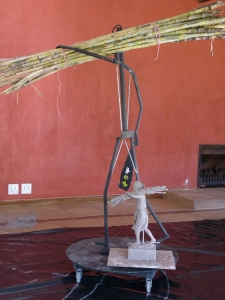 The armature is the structural "skeleton" of a sculpture. It needs to be strong enough to support the modelling materials. It also needs to be accurately measured from the maquette as it is not easy to make changes to it at a later stage. Welding isn't difficult. All that is required are a few learned skills, lots of protective wear, the right equipment (small welders are relatively inexpensive and easy to use) and patience, liberating the artist to make strong armatures of any size. The metal armature is covered in chicken wire. This will be the final support for the modelling materials. Tin snips, long-nosed pliers and silicon covered gloves are essential tools. When I work on a large scale I usually use Rhyolite (also known as cretestone) or plaster-of-Paris as an inexpensive support before I apply Plasticene. I cover strips of newspaper with mixed Rhyolite, and apply this to the chicken wire so that it locks onto it, forming a skin. When it is hardened I continue to work more rhyolite onto this skin, building up layers and beginning to shape the sculpture, sometimes carving back if required. When this form is dry I start working in the details with plasticene. I heat up the plasticene, and apply it while it is very soft and warm, scooping handfuls onto the surface, building up the form. As I work I continually refer to the maquette to make sure that this larger sculpture is a direct copy. The details are only worked on at the end when the basic shapes are confirmed to be accurate, there is much – putting on and then taking off – of the surface details, until I am satisfied. The sculpture is divided into sections so that the pieces are smaller and easier to manage. The dividers or walls are made from plasticene and are carefully placed to aid the dismantling of the mould when finished. Silicon rubber is mixed with a catalyst. It is then put on to the surface of the sculpture, making sure no air bubbles form between the wax surface and the silicon. The rubber is used because it is flexible and will capture all details. Plaster-of-Paris is then mixed with water and put over the silicon. Sisal is mixed with the plaster for re-enforcement. The dividing walls are removed and new ones are carefully placed for the start of the next section. When all the pieces have been covered in silicon and plaster, the 'plaster caps' can be removed and the silicon peeled off. The lost wax process begins with the silicon mould being coated with a molten wax layer of about 4 - 5mm thick. It is carefully removed from the mould when cool. The sculpture is gated, with runners and risers made of wax, joined by heat to the hollow wax sculpture. (These will act as air vents in the bronze pouring stage). The outer shell is created from layers of a ceramic shell which is strong enough to handle the heat of the bronze pouring. The shell consists of many layers of slurry and Shamot. The course layer of shamot is thrown on to the slurry layer. Each layer is dried before the next layer is applied – this gives the final mould strength to handle the heat of the kiln and the pouring of the bronze. The completed mould covered sculpture is now put in the kiln, and heated until the wax pours out, leaving a hollow space. Thus the name given to this process – the Lost wax casting process or Cire Perdue. The hot, hollow mould is balanced in sand and the pouring cup placed upwards. Molten bronze, heated in a furnace is now poured in, filling the gap where the wax was with molten bronze. When cooled, the outer shell is chipped off. The runners and risers are cut off using an angle grinder and other tools, and the sculpture is sandblasted to remove any leftover shell. The skilled foundry staff weld the pieces of the sculpture together; fixing any problem areas created in the casting. The surface of the bronze is worked intensely – sanding and polishing to get the perfect surface. Lastly the patina is applied to the surface of the bronze. This can be many things but usually consists of chemicals which change the colour of the bronze to a reddish-brown, black or green. The sculpture is then sealed with wax polish to stop any further changes to the colour. The foundryman usually does the installation of monumental works. He may use the help of a crane depending on the size of the work. I cast my bronzes at The Goodwin Foundry, the Sculpture Casting Services (SCS), and The falconer Foundry (they run Artist Residency programs as well). 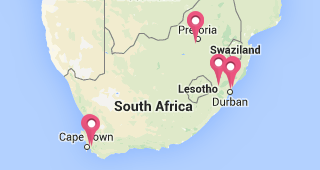 I am fortunate to have all 3 of these foundries down the road from where I live in the KwaZulu Natal Midlands, South Africa. Contact Seth Falconer for more information on his foundry and Artist Residency programs.